An end to the Sharks Board destroying our tiger shark population and other sharks in the marine protected area, the Aliwal Shoal. South Africa is considered a shark diving Mecca of the world. Every year thousands of tourists come to South Africa to have a unique diving experience with some of the oceans top predators. This eco-tourist industry brings in millions of Rands of revenue, and provides job opportunities to a country with a high unemployment rate. Sharks most frequently viewed are White Sharks, Tiger Sharks, Raggedtooth Sharks, Bull Sharks, Blacktip Sharks, Bronze Whaler Sharks (prime species of the Sardine Run), Hammerhead Sharks, Whale Sharks, and Cow sharks. It is estimated that Tiger Shark diving in Aliwal Shoal generated over R18 million (USA$2.5 million) during 2007, while White Shark cage diving in Gansbaai alone generates approximately R289 million per annum (USA$40 million). One Raggedtooth Shark is estimated to be worth R50 000 per annum (USA$7000) and can live for 40 years or more. In its lifetime it is therefore worth approximately R2 250 000 (USA$310 000). This same shark if slaughtered will fetch only R1000 once off (USA$140 – shark meat, depending on size and species, is worth only between R3-R18 per kilogram – USA$40c -2.5). Quite evidently, the socio-economic value of a live shark far outweighs the value of a dead shark and the loss of any one of these species will therefore have severe impacts. Despite this, of the over 200 different species of sharks found in South African waters, only White Sharks, Whale Sharks and Basking Sharks are fully protected. All other species may be legally caught and killed. Raggedtooth Sharks, Tiger Sharks and Bull Sharks have limited protection within Marine Protected Areas (MPAs). This limited protection of so few species is of little help since these animals know no boundaries and therefore remain vulnerable outside MPAs. Added to this, this protection is of little use when the existing laws are not adequately enforced.Since sharks play such a vital role in maintaining the delicate balance of the marine ecosystems there is growing concern as many species worldwide are being driven to the brink of extinction due to unsustainable fishing practices. Given all these facts, it is deplorable that these majestic animals of such high eco-tourist value are still allowed to be slaughtered. The South African government owes it to its citizens, the world and future generations to protect its natural resources, as well as to support the lucrative and high profile shark ecotourism industry, including those who depend upon it for their livelihood. In addition we demand that the compliance department immediately launches tangible measures to adequately enforce laws for currently protected shark species both in and out of MPAs. We cannot wait for government to do something – it will simply be too late. 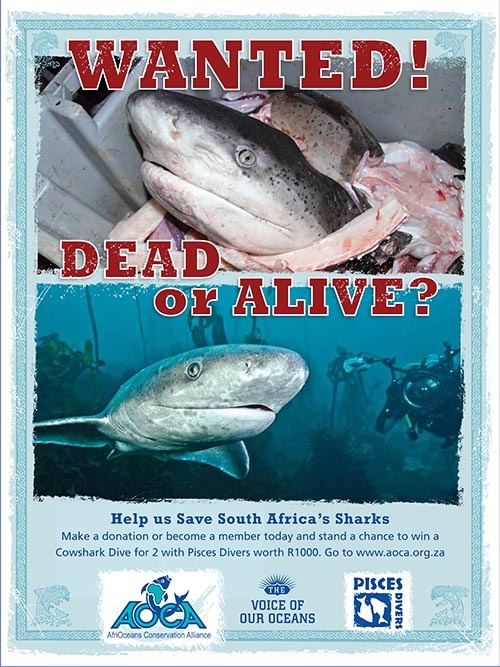 We therefore implore you to help us save our sharks. Our power collectively must not be underestimated. In 2007 and in 2010 petitions we ran were instrumental in helping to stop senseless shark slaughtering competition in South Africa. We believe that with your help we can make a difference again. As of Feb 2011 we already had over 6000 signatures but we would like to increase this to 10 000 before submitting the petition results as part of the lobbying process. Please therefore sign the petition below and forward this link to your friends. Thank you for helping us to help them! Watch our award winning ‘Sharks in Deep Trouble’ to find out why we need to protect our sharks.